YouTube is the best video sharing site with millions of users registered. Getting lots of views and subscribers is very important for you popularity on YouTube. 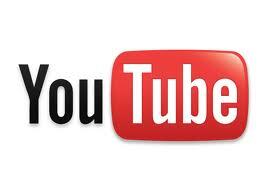 In this tutorial I will teach you & show you how to get more then 100, 000 views on YouTube. Its totally free & simple… All you need is little time, good internet connection & proxy list. 1. First of all Download YouTube Increaser from the official site. 3. Now when you install it and run it you can use it 30 times. Well, now I will show you how to bypass that limit & get free full version of it. Lets start. Click Start -> then click Run -> Type in Regedit and click OK.
Now, we will need to edit registry folder of our Tube Increaser 3.0. 4. Now we need proxy, because if we use our own IP we will get around 5 views only per day, because YouTube got some limit. 5. 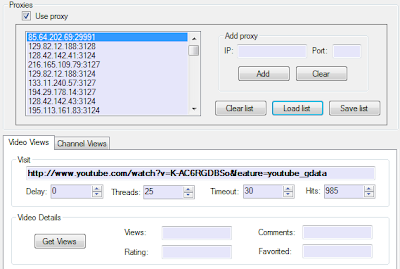 Download Proxy List from here or go to tube increaser proxylist.txt and save the proxy list in notepad and name it Proxy.txt. 6. When you save it on desktop, go to TubeIncreaser 3.0 and click Load List and choose list. 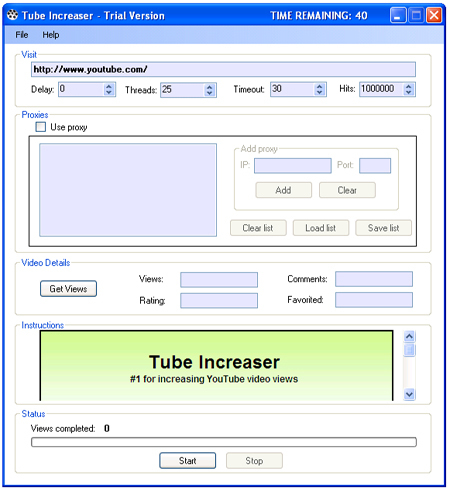 In YouTube URL bar, write your Video URL/link, from Hits box write numbers of views and click button Start. That’s all friends, really easy and simple. You can get around 200k views per day if your net is good.